Jeffries was born and bred in the Newcastle/Hunter region in 1894. After graduating from Newcastle High School he was apprenticed to his father as a mining engineer. His father, Joshua was the General Manager of the Abermain Collieries and young Clarence had become chief surveyor at Abermain Collieries by 1916. Only 20 years old when World War 1 erupted, Jeffries was already serving in the Hunter River Civilian Military Forces (CMF) as an officer. 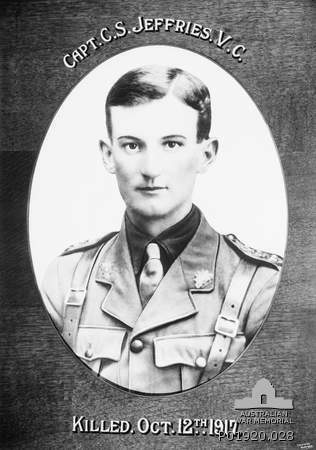 When the 34th Battalion was formed in early 1916 Jeffries enlisted as a second lieutenant but his talents were quickly recognised and he was twice promoted. He remained and fought with the battalion until his heroic but tragic death at the Third Battle of Passchendaele in October 1917. For his outstanding bravery and leadership (see citation) he was awarded the Victoria Cross (VC) posthumously. He was the only recipient of this award within the 34th Battalion. Captain Jeffries 1917. Courtesy of the Australian War Museum. Capt. 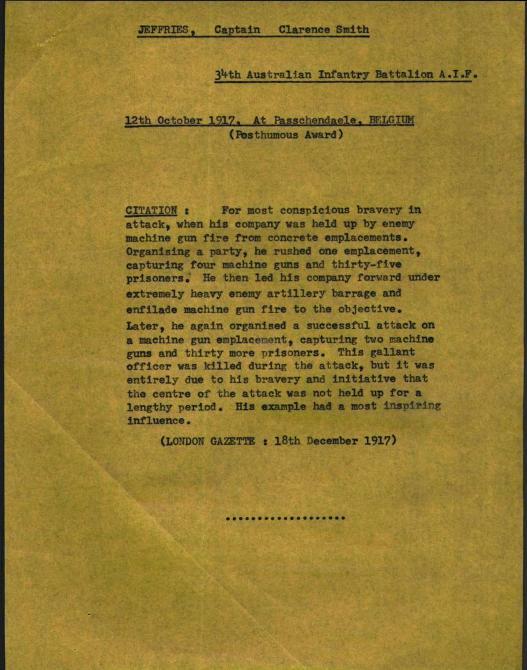 Jeffries' citation for extreme valour, October 1917: Courtesy of National Archives of Australia.